Search has worked its way into our schools as 94 percent of teachers said that search engines now served as virtual research libraries for students. Conducted by the Pew Research Center’s Internet & American Life Project in partnership with the College Board and the National Writing Project, the study was comprised of 2,500 middle- and high-school teachers who mostly taught advanced placement classes. The findings that search has become synonymous with research among students brought up the uncertainty of teachers regarding the reliability of information gleaned from search results. SearchEngineLand.com provided details about how today’s students are putting the “search” into research. 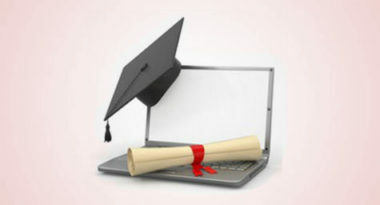 While Google and similar search engines were cited by teachers as serving the overwhelming majority of students’ research needs, other online channels were also credited for their research activities. The study showed that 75 percent of teachers believed that students used Wikipedia and other online encyclopedias, followed by 52 percent who thought YouTube and other social media sites were also utilized. Approximately 40 percent of teachers felt that their students’ peers and study guides like CliffNotes were used in the name of research. Only 18 percent of teachers named textbooks as a source of student research. Given the fact that today’s middle- and high-school students have been raised in the age of the Internet, it shouldn’t be surprising that so many turned to online search to find the information they needed instantaneously. 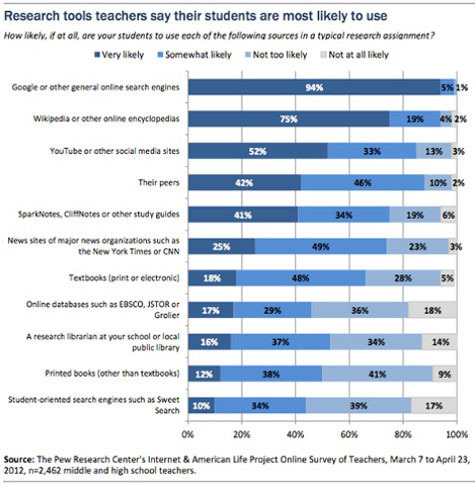 Teachers realized that students have a solid understanding of the way that search results are generated, but many expressed concern over the quality of their searching skills. A more troublesome issue regarded the integrity of the content delivered through search. While Google and other search engines may rank content well, that does not mean that students are able to properly gauge the validity of the information received. The study showed that only 5 percent of teachers felt that all of online content online was trustworthy, while 40 percent viewed only some of it as accurate. 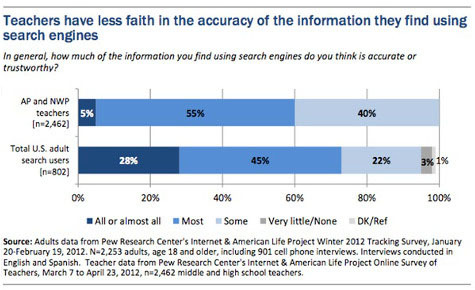 Still, the teachers were far less trusting of search results than the 28 percent of U.S. adults who believed that all online content was sound. As search has become a primary means of research for students, teachers said that a top priority in the classroom should be teaching how to determine the quality of search content. Some teachers had already started incorporating these lessons into their classes, but it’s important that more educators take the time to focus on search skills since it seems that the Internet will be powering our next generation of leaders. To discover how the power of search can improve your digital marketing results, contact MDG Advertising today at 561-338-7797 or visit mdgadvertising.com. MDG Advertising, a full-service Florida advertising firm with offices in Boca Raton and New York, NY, specializes in developing targeted Internet marketing solutions, exceptional creative executions and solid branding and media buying strategies that give clients a competitive advantage. Our core capabilities include branding, logo design, creative, digital marketing, print advertising, direct mail marketing, media planning and buying, TV and radio, video, Web design and development, email marketing, social media marketing, search marketing, and search engine optimization (SEO).